Today, May 19th, marks the 100th Anniversary of the death of Jack Kirkpatrick. Never heard of him? 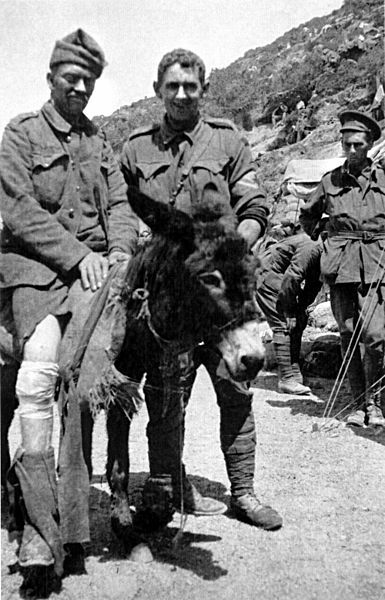 Maybe you are familiar with the stories of “Simpson and his donkey” which came out of the early stages of the Gallipoli campaign during WW 1 – it’s the same person. Jack was born in Britain in 1892, joined the merchant navy at an early age, deserted ship in Australia in 1910 and lead the life of a modern-day backpacker. Apparently to secure a free trip home to Britain he enlisted in the Australian Army as a field ambulance stretcher bearer in 1914 and used his mothers maiden name of “Simpson” so his desertion escapade didn’t come back to haunt him. But, as with most things in life, everything didn’t quite go to plan for Jack. Instead of returning home, he, with thousands of others, was put ashore at Gallipoli, in Turkey, on 25th April 1915. The idea being that allies would take control of the Dardenelles and restrict the Ottoman Empire’s participation in the War. In reality the invading force hardly got off the beach. For Jack and his mates, like it or not, they were straight into it and immediately went to work carrying the wounded from where they fell, back to the beach for evacuation. He did this for three and half weeks until his luck ran out and was shot on 19th May. Just another casualty of another stupid war you may say. Well in one sense that is true, but in Jack’s case it is the legacy of his deeds during those 25 days that ensures he was not just another statistic. Firstly, Jack was totally committed to his cause – and that was to ferry wounded soldiers back to treatment stations. He reportedly transported approximately 300 injured and dying. Without his diligence so many would have no doubt died in no mans land of their injuries. He was also highly resourceful and did what it took to do his job well. On the first day of the campaign, simple military plans were beginning to fall apart. He was supposed to be in a 6 man stretcher bearing team. But this number dwindled quickly due to casualties and being assigned to other duties. Also, they ran out of stretchers so he had to resort to carrying people back over their shoulders. It was at this point that he spotted a donkey, commandeered it and it became his “field ambulance”. And finally Jack leaves the world with a legacy of hope. At a time when the media is awash with debate about whether millennials can make the world a better place in the future, lets remember Jack was 22 years of age when he fell 100 years ago.